That morning was 10/29, and the morning name then was Paloma Picasso: an alliterative double amphibrach. Bringing with it an allusion to her fashionable clothes and accessories, and to her father’s paintings. The town of Wallisellen in Canton Zürich, Switzerland, has just come up again on this blog (in the posting “Three Züricher Peter Zwickys”), as the site of the Zwicky silk-thread company and now the Zwicky construction and real estate company. Two notable things about the place (from its Wikipedia page): the etymology of its name, which looks like a compound (and is), but without easily identifiable parts; and a Swiss German nonsense rhyme that incorporates the town’s name. “The Hut-Sut Song (a Swedish Serenade)” is a novelty song from the 1940s with nonsense lyrics. The song was written in 1941 by Leo V. Killion, Ted McMichael and Jack Owens. The first and most popular recording was by Horace Heidt and His Musical Knights. The lyrics of the chorus are supposed to be a garbled rendition of a Swedish folk song. The chorus goes in part: Hut-Sut Rawlson on the rillerah and a brawla, brawla sooit. The song then purports to define some of the words, supposedly Swedish: “Rawlson” being a Swedish town, “rillerah” being a stream, “brawla” being the boy and girl, “hut-sut” being their dream and “sooit” being the schoolteacher. You can listen to the 1941 Horace Heidt recording here. Many other recordings were made over the years. The parody reproduces the recurring /ɪŋz/ rhyme of the original, once as /ɪŋz/ (the things of the original), three times as /ɪŋ/. An addition to my “na na na” posting, with an xkcd cartoon compressing a collection of “na” songs into a chart: the song “Get a Job” and the name Sha Na Na for the rock group that took its name from the song. Nonsense syllables rule! The “Valse” from Façade, which I seem not to have posted about before. 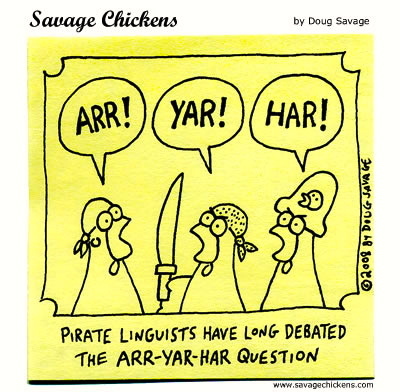 Talk Like a Pirate Day isn’t until September 19th, but pirate language is always in style. F&T is a recurrent feature in Zippy. It’s a masterpiece of (Gricean) irrelevance, in which the conversational partners flagrantly talk past one another. What each of them says is grammatical English, though often peculiar in content. But the exchanges don’t cohere at all. You are currently browsing the archives for the Nonsense category.